Traditionally, marine protist plankton were considered to be either “microzooplankton” (which eat) or “phytoplankton” (which cannot eat, but only photosynthesize). 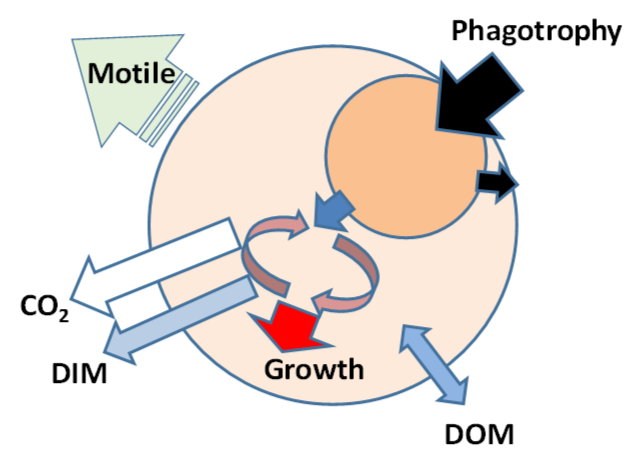 Mixotrophic protist plankton – mixoplankton – are single-celled organisms that can both eat and photosynthesize, in their one cell. Dismissed as of minor consequence by mainstream marine science for over a century, we now know that most “phytoplankton” and 50% of the “microzooplankton” in the upper ocean are mixotrophic. When we went to classify mixoplankton we found that there is more than one functional type within this plankton community. Accordingly, we have proposed a new functional classification of protist plankton. Here we present a brief overview of the different protist functional types. Microzooplankton are heterotrophic protists, gaining energy and nutrition primarily via eating (i.e., phagotrophy). They are motile, hunting and selecting different prey types. They release CO2 and dissolved inorganic materials (DIM). They may use, as well as release, dissolved organic matter (DOM). They also release a portion of undigested prey (outward black arrow). Generalist Non-Constitutive Mixoplankton (GNCM) are protist plankton that gain energy and nutrition via phototrophy using phagotrophy plus phototrophy. For phototrophy, they use photosystems (kleptoplastids) acquired from their phototrophic prey. However, they cannot maintain these plastids, so they need to top-up frequently. Fortunately, they can acquire plastids from many prey species. plastidic Specialist Non-Constitutive Mixoplankton (pSNCM) represent an enhancement over GNCMs, in that these organisms can maintain, and to some extent control, the plastids acquired from their phototrophic prey. They thus do not need to top-up with new plastids frequently. 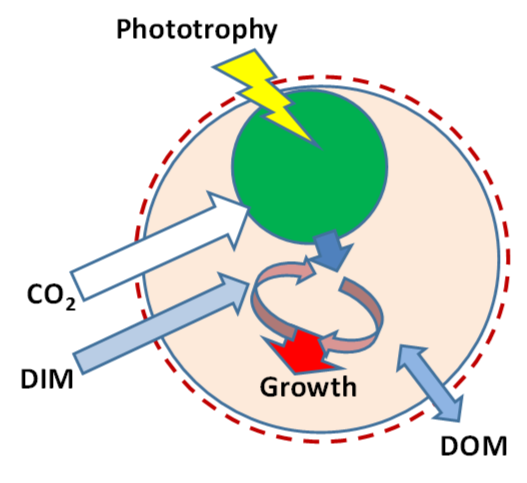 However, they can only perform this trick using plastids from a few prey species, so they must find the correct phototrophic prey. 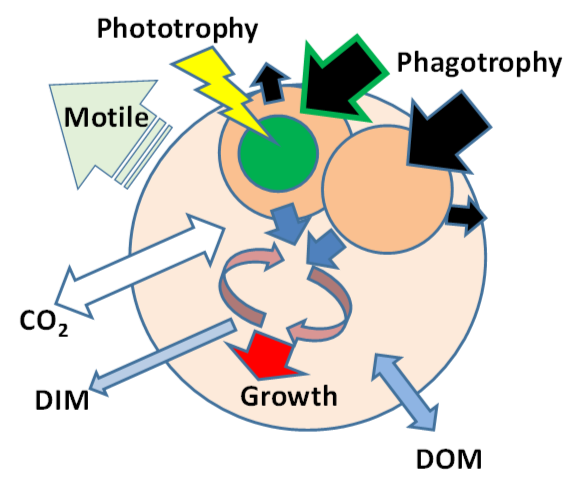 endosymbiotic Specialist Non-Constitutive Mixoplankton (eSNCM) represent an alternate to pSNCMs which sees the entire phototrophic prey held within the protist cell as endosymbionts. 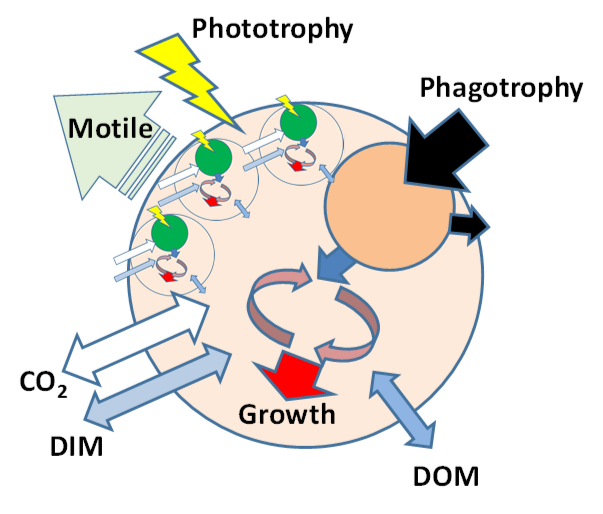 The prey grow and multiply within the host, making use of nutrients (DIM) taken up from the sea water &/or released by the host during prey digestion, plus their own phototrophy. 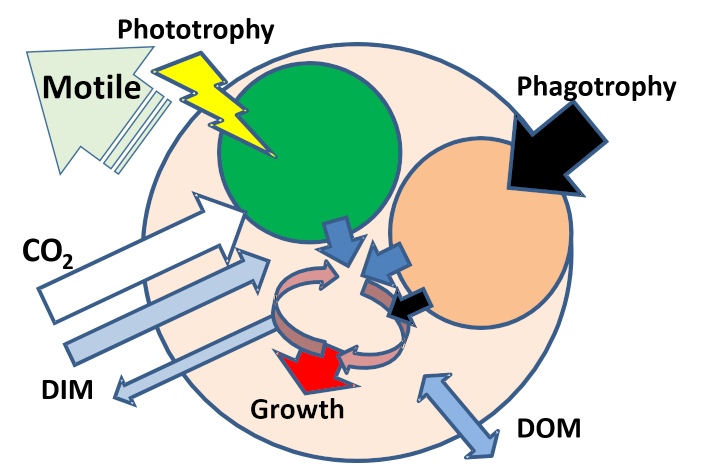 The host gains from DOM released by the symbionts, plus they could consume their phototrophic symbionts. Constitutive Mixoplankton (CM) represent an enhancement over pSNCM, in that these organisms possess a constitutive ability to make their own plastids to perform photosynthesis. CMs can thus mix and match phagotrophy and phototrophy, as they require, to balance their needs for energy and nutrients. This is the configuration usually considered as the archetypal plankton mixotroph. Phytoplankton are protists which have lost the ability to eat via phagocytosis. These are well represented within the protist plankton by the diatoms. Diatoms have lost the ability to feed via phagocytosis. They cannot swim (though some can alter their buoyancy). 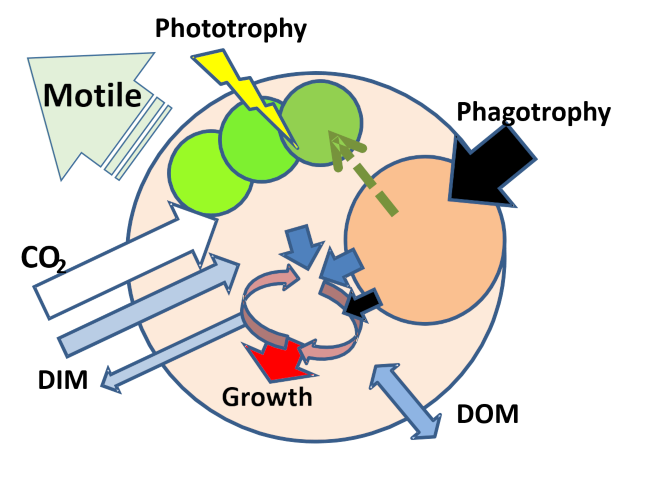 They have a rigid cell wall made of silicate, which may help protect them from grazers but also enables them to be more vacuolated than normal protists, thus needing less nutrient to support cell division for a given cell size.